Physical therapists and athletic trainers regularly work with those recovering from injuries or surgeries to their feet and ankles. An upcoming HydroWorx webinar will feature a well-respected rehab expert from OrthoCarolina who consistently utilizes innovative water therapy exercises for her clientele. "Water’s natural properties such as buoyancy and hydrostatic pressure reduce the effects of gravity and swelling that can be problematic on land." There are many land-based physical therapy challenges that must be overcome by rehabilitation professionals when they work with clients who have recently injured – or had surgeries affecting – their ankles, feet and peripheral areas. The biggest challenge is the problem of introducing weight-bearing activities too soon. Another concern is making sure that patients and athletes are engaged in the exercises and environment so they actually want to make progress. One medium – water therapy in an advanced, warm-water therapy pool – has been proven to help to solve these challenges. Water’s natural properties such as buoyancy and hydrostatic pressure reduce the effects of gravity and swelling that can be problematic on land. The key is apparent: To engage the client population appropriately for maximum benefits, as well as to have a litany of water therapy tools and exercise possibilities at the clinician’s disposal. HydroWorx, the leading provider of aquatic therapy pools, is offering a free webinar this week, entitled “Progression of Foot and Ankle Injury Rehabilitation Using Aquatic Therapy.” The webinar will provide attendees with innovative methods to overcome the above mentioned rehabilitation issues that can be a barrier to progress. Cheryl Bennett, PTA, CGT, will share her experience with aquatic therapy during the one-hour webinar. This event is scheduled for Tuesday, November 24, from 1-2 E.S.T. and will highlight Bennett’s own results as an Aquatic Therapist at University Physical Therapy, which is part of the nationally-recognized OrthoCarolina orthopedic practice. “Progression of Foot and Ankle Injury Rehabilitation Using Aquatic Therapy” will feature several key treatment ideas for patients with foot and ankle injuries. These include, but are not limited to, how to strengthen the range of motion, flexibility and strength of the foot and ankle using water therapy exercises; how to safely progress from aquatic therapy to land-based, weight-bearing therapy; and effective ways to build core strength and musculature to support healthy recovery. At the end of the webinar, participants will have the opportunity to ask questions of Bennett. Registration is free for “Progression of Foot and Ankle Injury Rehabilitation Using Aquatic Therapy”, but it is necessary to register to play an active role. 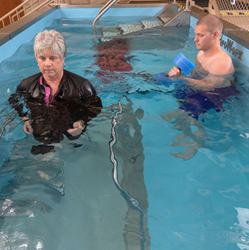 Since the late 1990s, HydroWorx has manufactured aquatic therapy pools with built-in underwater treadmills to enable physical therapists to more effectively offer their patients the opportunity to increase range of motion, decrease risk of falls and joint stress, and remain motivated through the rehab process. Products such as the HydroWorx 2000 and 500 Series therapy pools, along with the new construction-free HydroWorx 300 system have revolutionized the face of aquatic therapy; in fact, HydroWorx technology is used by world-class facilities such as Presbyterian Village North, ClearChoice Health Care, PowerBack Rehabilitation by Genesis Healthcare, Carolina Village Retirement Community, Lakeview Village, PruittHealth and many other senior living communities across the country.